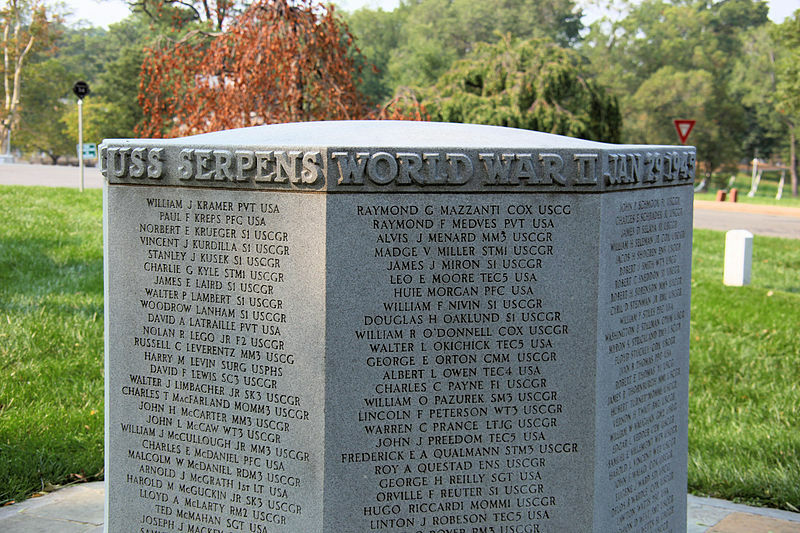 Photo credit: Tim1965, View of the west side of the the USS Serpens Memorial at Arlington National Cemetery near Arlington, Virginia, in the United States. The ship exploded on January 29, 1945, while anchored off Laguna Beach at the island of Guadalcanal. Yesterday marked the anniversary of the loss of the Blackthorn, today it is the 68th anniversary of the loss of the USS Serpens (AK-97) that resulted in the loss of 196 Coast Guardsmen plus 57 Army stevedores. This was the largest loss of life in a single incident in the history of the service. The names are here. It’s Lunga Beach, not Laguna Beach. My uncle was on the ship.